51MSG-018AA This 1.5 tonne cooling capacity wall mounted split air conditioner has a rotary compressor. It has active carbon filter and has the following features like auto swing, auto restart, timer, fan mode, independent dehumidification, sleep mode and self diagnosis. The noise levels are 44db and power consumption is 1530 watts. Split air conditioning systems are slowly taking over the traditional window air conditioning systems primarily because, they lead to less energy loss due to the nature of their built & components; less heat loss as compared to window ACs and easier installation / maintenance. In this space we are reviewing the Duraedge Plus 42KGE-018M (51MSG-018AA) Split AC by Carrier. The DURAEDGE split AC comes in off white colour with smooth edges and a glossy finish, thus making it an attractive addition to your walls. The remote control is hand held and the shape ensures a good grip. It is of the same colour as the AC. The remote control also comes with a wall mounted stand that can be easily installed if needed. Electrostatic Carbon & Dust Filters – The unit comes inbuilt with active carbon and electrostatic fibre filters which essentially helps in air purification ensuring that the recipients breathe a fresher air. Activated carbon filters such as found in this AC system, capture more dust and dirt than standard filters. These carbon filters also eliminate unpleasant odours in the room which is a quite pressing requirement in most settings. If your house is filled with unwanted smells of spices, for e.g., an AC system such as the DURAEDGE by Carrier is a good choice. However, these carbon filters cannot be cleaned due to the nature of their job and if need be, will have to be replaced. Turbo Mode – The presence of turbo mode in the AC unit helps in achieving the set temperature quickly and effectively by operating at the maximum fan speed for 30 minutes. In this particular AC model, the desired temperature is reached pretty quickly; for e.g., a temperature of 21 degrees when the outside temperature is around 35 to 40 degrees, can be achieved in approx. 20 minutes. Independent Dehumidification – The DURAEDGE Plus 42KGE-018M (51MSG-018AA) split AC unit comes with inbuilt NeXgen dehumidifier which helps in reducing the humidity of the room but at the same time retains cooling, thereby ensuring a comfortable temperature in the room. In tropical climates, especially around the vast coastline of India, this feature in ACs is very crucial. Rust free Cabinet – This device is made with 100 percent copper and comes with 5 layers of protective coating to ensure complete freedom from rust. The AC cabinet can withstand extreme weather conditions and therefore, can be functional for years at a stretch. It is also perfect for the Indian weather conditions which range from extreme to humid at most places in the country. The Auto Restart feature ensures that in the case of a power cut, when the power is back, the unit will restart at its previous functions and settings; a setting which is much needed in our country given the frequent power cuts. Although you can control the air deflection in the AC system by a simple button on the remote, the Auto Swing feature rotates the air deflector automatically thereby ensuring that there is uniform cooling in all parts of the room. The AC unit comes with a bright LED display in internal unit. This AC unit can also be run on automatic mode using the 24 hr. timer on the remote which programs the unit to start and stop as assigned by the user. The Sleep Mode feature, when enabled, gradually increases the temperature while one is sleeping. This feature therefore helps is energy saving and thus, cost saving, if used regularly. Refrigerant Leakage Detector – Detection of refrigerant leakage is crucial in Air conditioning systems. DURAEDGE comes with an inbuilt early warning system that detects a condition of this leakage, and shuts down the system while at the same time displaying the error code on the internal AC unit (as per mentioned on the product website, not observed directly). Self Diagnosis Function- A smart feature of this AC is that if the unit malfunctions for any reason, it will shut off immediately while indicating an error code on the indoor unit to enable efficient servicing (as per mentioned on the product website, not observed directly). LCD remote – The AC unit is accompanied with a LCD remote which uses two AAA batteries to run. The remote has signal strength between 8m to 11m. 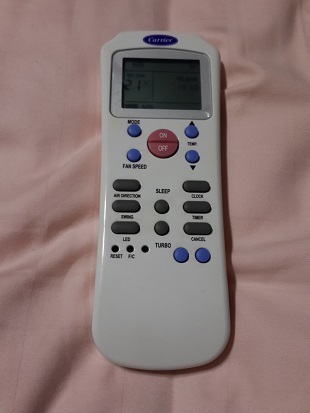 The main performance features present on the remote device are the operating mode (allowing the user to choose between auto, cool, dry and Fan buttons); 24 timer setting function; temperature setting between 17 degree to 30 degree Celsius; clear LCD screen displaying all the selected options; air direction and swing buttons; sleep button; turbo mode button; and clock feature to name a few. The remote device is very user friendly and for any difficulty in usage, there is a detailed instruction manual for the remote separately. The AC unit under review is of 1.5 tons and is being satisfactorily used by the reviewer to cool a room of 30 square meters. The net weight of this device, as mentioned on the accompanying manuals and product website is 12 kg for the indoor unit and 47 kg for the outdoor unit. The noise of the indoor unit is very minute and comfortable to bear with. The noise level of the outdoor unit is pretty high and one can feel a vibrating sound when near the outdoor unit. 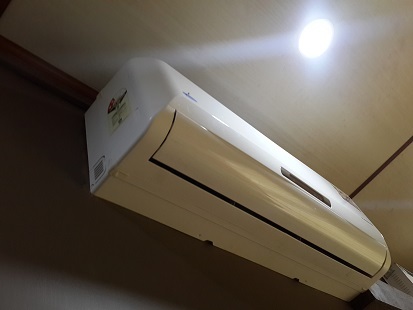 Although, split ACs are easier to install as compared to window ACs, it is still recommended that professional assistance is sought for installing the AC unit as it is still complicated to do so on one’s own despite a detailed instruction manual accompanying the device. The air flow is very uniform for a room of about 30 square meters on the auto swing mode and the resulting air has a pleasant feel. The AC device and accompanying remote control is extremely easy to use with clear & bright displays on the remote as well as indoor unit display panels. The AC unit comes with a 1 yr. warranty for the AC unit and 5 year compressor warranty. Carriers ACs have authorized service stations in almost all parts of India and therefore any service requirements should be easily addressed. The reviewer’s experience in this area has been extremely positive. - A bulky and noisy outdoor unit, which also acquires considerable vertical space. - There is almost a 1 minute gap between switching on the main power switch and the AC becoming operational (observed with an inverter being used). - Depending on the distance between the outdoor and indoor units and distance between the power plug & AC unit, lot of wiring work may be involved in the installation process. If the AC is being installed in a new building, these wires can be hidden in the walls but for old buildings or already existing rooms, the sight may not be very pleasant. 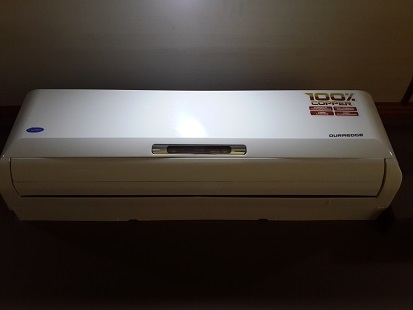 Given the performance of this AC unit as experienced by the reviewer and keeping in mind the features, performance and disadvantages, a rating of 9/10 is suitable for this device.